Digitrax uses Option Switches to setup stationary decoders. They can be set by standard switch commands or with special LocoNet commands. 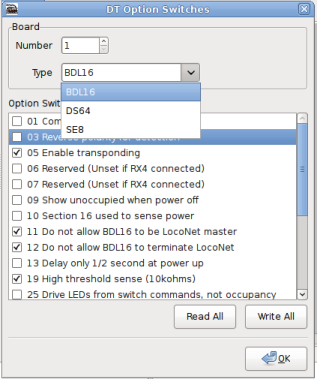 The target decoder must be set in programming mode before option switches can be changed; See manual. This is the board address of the decoder. This address cannot be changed with this dialog, you need to check the manual for this. Select the wanted board type to program. Each board type has its own set of option switches as is listed after type selection. Read all the option switches from the address and type set for the board. Write all the option switches from the address and type set for the board.